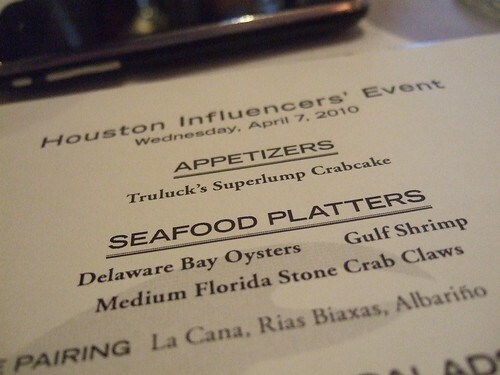 Truluck’s, a small and growing chain of upscale seafood restaurants, recently sponsored an “influencers event” at its Houston location. An “influencer” is the newish umbrella term created by P.R. professionals that refers to traditional media plus social media types — bloggers, Twitterers and the like. It’s what a “media tasting” used to be when there were just radio, TV, and newspapers. The dinner was complimentary to those who attended, including me. Like several of my dining companions at the event, Truluck’s had been completely off my restaurant radar. I remembered going there once in the distant past, when it was in a curvy, shiny, ship-like building a bit further down Westheimer. My only other recollection was that it specialized in stone crab claws. On this Wednesday in April, Truluck’s was doing a booming business in it’s sleek bar and dining room, located in a strip center just past the Galleria on Westheimer. The bar was mainly filled with professional types from surrounding Galleria-area offices. An enthusiastic piano player belted out hits from R.E.M. and Steely Dan. Truluck’s is still very much known for its Florida stone crab claws and seafood in general. It’s also taken up the cause of sustainable seafood — always a plus for upscale fish restaurants. Florida stone crab claws are by nature one of the great matches of sustainability and human consumption — the big “crusher claw” that we all love to eat is harvested (ouch!) from the live crab which is then returned to the farm/ocean. It will then conveniently grow another claw in about a year. Talk about a renewable resource. The Florida stone crab claws that came with the seafood platter were indeed delicious and I could eat my way through quite a few of them. The other appetizers were all quite good except the wedge salad which seemed dreary and droopy, and the gumbo which included tomatoes as an ingredient. This is Houston — don’t put tomatoes in your gumbo, please. The entrees were all generally good and plentiful. Texas Striped Bass Pontchartrain being a highlight. Having grown up in Southeast Texas eating pontchartrain dishes I can say this one was well executed. The Miso-Glazed Chilean Sea Bass was another standout. Chilean sea bass is usually shunned for its un-sustainability, but according to Truluck’s they get their’s from a sustainable farm off the coast of Chile (or is that Argentina?). Service for the evening was professional and friendly. The general manager made frequent trips to the table and seemed genuinely interested in our experience. The wine pairings were good for the mid-range wines they served us. Overall, Truluck’s made a very positive showing for this influencer’s dinner. If I’m in the mood for Florida stone crab claws, this will be the first place I think about and will go out of the way to get there. If I’m in the Galleria area without plans for lunch or dinner, and I’m in the mood for seafood, I’d definitely consider visiting Truluck’s. This entry was posted in Blog Only, Restaurant Reviews and tagged seafood, stone crab claws, truluck's. Bookmark the permalink. We've been by several times since the move from the "shiny place". Always been good to very good food, with excellent service. I was trying to figure out the best way to reach you to invite you to a similar event that my company is hosting later this month. I thought you might be interested in this 'fish with a story' for your blog. In an effort to be more ‘green’, please accept this invitation to our Tasting Event, details below. There’s a new fish in Texas. Barramundi is landing on menus and supermarket shelves throughout the Lone Star State, and we’re inviting a few select chefs, bloggers, media and industry folks to taste barramundi and learn the fascinating story behind the fish that’s making national news. Meet the fish and the people behind it. Join us on April 27th to savor Chef John Sheely’s Australis Barramundi dishes and learn why barramundi is garnering local and national attention for its flavor, health benefits and eco-friendly profile. You’ll also meet with renowned sustainable seafood pioneer and founder of Australis Aquaculture, Josh Goldman. Josh will give you a behind-the-scenes look at how Australis is changing the face of fish farming, and why Australis Barramundi has been called ‘the perfect fish for a changing world’. Seats are limited to first 30. I hope you can join us on the 27th! Food is excellent with good service. However, the noise level is intolerable. Part of a good dining experience is to be able to converse with one's dining guest(s). The wine menu is naive. The Truluck's in Dallas is one of my favorite places for fresh crab claws. The steak is always tender; the wedge salad is done with extra care and just the right amount of blue cheese, and the corn chowder (with or without chicken or crab) is good enough for a meal in itself.